This is Why the GOP Keeps Losing Elections. The polling from the last few cycles, tells the story…The vast majority of Americans come down to the right of anything either party has puked up since Reagan. 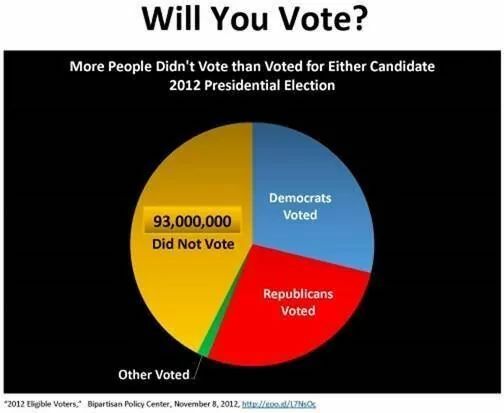 Which in turn is why most Americans no longer vote, feeling there is nobody to vote FOR. “I’m not Team D” isn’t enough to get out the vote…. the people are smarter than that. Yet, we elect Democrats. Why? Well, ignoring vote fraud, which is another topic altogether, the answer is simple… there are no conservatives to vote for. So, the majority don’t vote, not wanting to sign their name to either liberal, or liberal lite as represented by today’s GOP. Those that still do vote come down in the area of the radical left, which explains both congress and Obama. Though I note with satisfaction some disenchantment there. The Democrats are publicly worried their GOTV efforts will fail this mid-term. They may be right, but its an open question who wins. I say again, there is no winning elections for the GOP, as a rule, unless and until they start offering real conservatives to vote for. And its America that loses when the GOP fails to offer real conservatives on the ballot.